Nothing you see here is real, even though the conversion or the presented background story might be based historical facts. BEWARE! The Dassault/Dornier Alpha Jet is a light attack jet and advanced trainer aircraft co-manufactured by Dassault Aviation of France and Dornier Flugzeugwerke of Germany. It was developed specifically to perform the trainer and light attack missions, as well as to perform these duties more ideally than the first generation of jet trainers that preceded it. Following a competition, a design submitted by a team comprising Breguet Aviation, Dassault Aviation, and Dornier Flugzeugwerke, initially designated as the TA501, was selected and subsequently produced as the Alpha Jet. Both the French Air Force and German Air Force procured the Alpha Jet in large numbers, the former principally as a trainer aircraft and the latter choosing to use it as a light attack platform. In July 1978, Dassault signed an agreement with American aircraft manufacture Lockheed to market the Alpha Jet in the US market, the arrangement included provisions for Lockheed to manufacture the Alpha Jet under license. The Alpha Jet was considered as a candidate for the US Navy's VTXTS advanced trainer program, which was eventually won by the McDonnell Douglas T-45 Goshawk, a modified version of the Hawker Siddeley Hawk. Proposed modifications included undercarriage changes for nose-tow catapults and a stronger arrestor hook, as well as various US-sourced avionics and other equipment. The Alpha Jet program remained prolific, though. During the early 1990s, the French Air Force investigated the “Alpha Jet 3” program, which involved installing a fully digital cockpit, a modernized communications suite, and a full navigation/attack and sensor training system. Another development line was the Alpha Jet Lancier (Lancer), which would enable the trainer to act as a light, all-weather multi-purpose attack aircraft. The most obvious modification was the addition of an Anemone radar in an extended nose section with a radome, similar and shape and size of the Super Étendard’s nose section. The Anemone radar was an improved and very compact derivative of the Super Étendard’s Agave radar, weighing only a mere 60kg. The Anemone would provide the weapon system (based on the developments for the Alpha Jet 3) with all the data required for firing air-to-sea AM39 missiles, and the data needed for air-to-ground fire control. It could also be used for aircraft self-protection, as it could also handle the fire control of air-to-air weapons. Dassault had high hopes in export sales for the Alpha Jet Lancier (e. g. to Egypt, Qatar and Nigeria), but interest was lukewarm since the Alpha Jet was a design that had been superseded by more modern constructions, and its operation costs were relatively high. 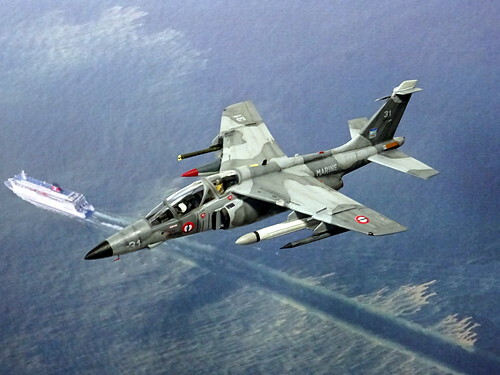 However, in 1991, when the Alpha Jet Lancier was still on the drawing board, the French Aéronavale was looking for an advanced trainer that could also be used for carrier start and landing training – basically as a replacement for the outdated Fouga CM.175 Zéphyr. The Alpha Jet offered several benefits, including its two engines for improved operational security and the fact that the type had already been in use with the French Air Force, so that the maintenance infrastructure and experienced mechanics were readily available. Even the demand for a maritime variant could be quickly realized – thanks to the VTXTS engagement in the late Seventies. The result was the so-called “Alpha Jet Lancier M”, which incorporated all the aforementioned elements. An order for 31 aircraft (one prototype plus 30 serial aircraft) was placed in early 1992. The prototype was ready in May 1993 and incorporated further changes like uprated engines (delivering 10% more thrust than the former Larzac turbofans used on the land-based variants) or foldable outer wing sections, a reinforced arrester hook and a fixed (but detachable refueling probe). The landing gear was also modified for carrier operations, with a bigger spring deflection and a more rigid, twin-front wheel that also featured a launch hook. The Anemone multi-mode radar was augmented by a lightweight Ferranti Type 105 laser rangefinder, mounted in a fairing under the port side cockpit flank, leaving space for an optional gun pod that could be carried under the fuselage. A Doppler radar for navigation purposes was added in a shallow fairing under the cockpit, too. Mission avionics were further enhanced by a helmet-mounted sight, improved cockpit displays, a datalink, and improved night vision goggles compatibility. The Alpha Jet Lancier M’s most powerful weapon was the AS.39 Exocet missile. Two of these weapons (weighing 670 kg each) could be carried on the inner pylons, even typically only a single one was carried with a drop tank as counterbalance and range compensation on the opposite pylon. The relatively compact missile is designed for attacking small- to medium-size warships (e. g. frigates, corvettes and destroyers), although multiple hits are effective against larger vessels, such as aircraft carriers. Its rocket motor, which is fueled by solid propellant, gives the Exocet a maximum range of 70 km (43 mi; 38 nmi). It is guided inertially in mid-flight and turns on active radar late in its flight to find and hit its target. As a countermeasure against air defense around the target, it maintains a very low altitude during ingress, staying one–two m above the sea surface. Due to the effect of the radar horizon, this means that the target may not detect an incoming attack until the missile is only 6,000 m from impact. This leaves little time for reaction and stimulated the design of close-in weapon systems (CIWS). Trials of the Alpha Jet Lancier M prototype lasted until 1994, when serial production eventually started – just in time for the Zéphyr replacement, the trainer had been in service since 1960. The first machines arrived at the operational units in early 1995, though. Dassault still had high export hopes, but despite having an official operator now no further orders were coming forth – the Alpha Jet Lancier was simply too expensive. Plans for upgrading the land-based Alpha Jet fleet were also ultimately abandoned as being too expensive. In 1998, France's defense ministry examined prospective upgrades focused on the Alpha Jet's cockpit, such as the installation of a new Head-Up Display (HUD) and multifunction displays, though. In June 2003, Dassault revealed its plans for an Alpha Jet upgrade to potentially meet the French Air Force's long term training requirements. This upgrade was similar to that which was performed for the Belgian Air Force's Alpha Jet fleet, involving the installation of a glass cockpit, increasing cockpit compatibility with frontline aircraft such as the Dassault Rafale and Dassault Mirage 2000, as well as a structural overhaul. As a result of post-Cold War military cutbacks, Germany already elected to retire its own fleet of Alpha Jets in the 1990s and has re-sold many of these aircraft to both military and civilian operators. The Alpha Jet has been adopted by a number of air forces across the world and has also seen active combat use by some of these operators. The kit and its assembly:. Another entry for the “Old Kit Group Build” at whatifmodelers.com, #4 to be precise. The basis for this conversion is the venerable Heller Alpha Jet in 1:72 scale from 1979, even though in a much more recent Revell re-boxing as a Belgian aircraft with a black/yellow/silver anniversary paint scheme. Anyway, the moulds must have suffered a lot in the meantime, because the Revell offering comes with lots of flash, ugly ejector pin markings and even some sinkholes. I have built an old, original Heller kit a while ago, and this was much more crisp and defined! Building the fuselage was no fun – nothing would fit, and the kit’s construction is really complicated. O.K., the Alpha Jet’s shape with its engine nacelles and the curved belly is complex, but the kit’s solution is far from perfect. Another true weak point are the air intakes: they end after 3-4mm in a staggered, vertical wall. Really ugly, so I drilled the intakes open and moved the still necessary view blocker (black foamed styrene) a bit further back. IMHO, the only potential operator for this fictional yet rather complex and expensive Alpha Jet variant would be France, and so the Lancier M ended up in the hands of the Aéronavale. Consequently, I gave the aircraft a Nineties paint scheme inspired by the two-tone grey livery of the late Super Ètendard – also a bit of an unusual, yet familiar, touch. The basic colors I used are Humbrol 164 (Dark Sea Grey) and 165 (Medium Sea Grey), because I wanted to prevent a US look – and the frequently recommended tones of FS36118 and FS35237 are IMHO just wrong, Gunship Grey being too dark, and the grey blue being …simply much too bluish. The British tones work quite well, though, even though I still wonder about the “true” colors of this paint scheme? The cockpit interior was painted in very dark grey (Humbrol 67) for some contrast to the outside, the landing gear wells and the struts became Aluminum (Humbrol 56), as well as the air intakes. The interior of the landing gear covers was painted in chrome yellow primer (Humbrol 81), for some more color contrast. The Barracuda 2 pod was painted in dark green, while the chaff dispenser became dark grey – as a small color contrast to the grey aircraft. The Exocet missile became white with a light grey radome, according to the real thing, but as another disruption the single drop tank received the old Aéronavale scheme in dark bluish grey and white, together with a red tip (marking the flight the aircraft belongs to). The decals come mostly from a Berna Decals aftermarket sheet for French Bréguet Alizés. The sheet features, among others, a late, dark grey aircraft, and this option provided the small roundels and the grey codes. Escadrille 59S was chosen, since it was available in the sheet (with the squadron’s emblem) and originally a unit for night/all-weather training, disbanded in early 1997. A simple conversion, yet very thorough and surprisingly convincing. The Lancier’s longer and more massive nose changes the character of the sleek Alpha Jet a lot, and the grey-on-grey paint scheme with the toned-down markings adds a unusual touch to the normally much more colorful aircraft. The scheme looks very natural on the Alpha Jet, too.